Spindex Industries seems to be a reasonable solid business. 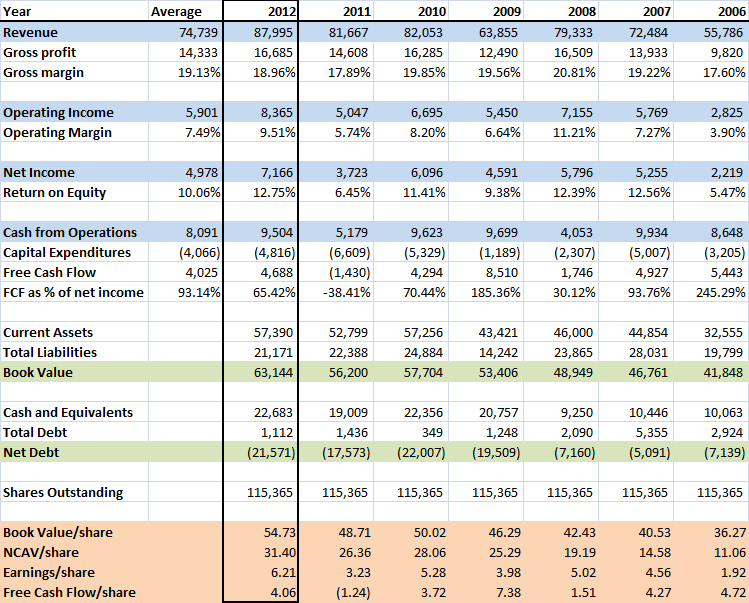 Gross margins are stable and despite a net cash position the average return on equity is decent. Book value has grown 7% a year since 2006 while they returned on average roughly 30% of net income to shareholders through dividends. If a stable solid business has on average a return of 10% on equity I’d say it should be worth roughly book value. That’s of course if the company is just the company itself, and not a company + cash box. So in this case the company should be worth roughly book value + the value of the net cash on the balance sheet. Book value is 54.7 cent per share while there is 18.9 cent per share of cash for a total value of 73.6 cent per share. With the shares trading at 39 cents it implies a possible upside of ~90 percent. That’s pretty decent, but I would argue that at that point the shares would be overvalued. The large cash position of the company implies in my opinion sub optimal capital management and some sort of discount should be warranted to account for this. I have no idea how big of a discount would be fair, but it should be bigger than zero (and smaller than the current 47%). In addition you could argue that you would want a bit of a discount because of the countries the company is active in, or that some of the cash on the balance sheet is required as working capital. I know little about the insiders of the company, but there are two things that I like. They are not paid with options, but cash bonuses, keeping the share count constant. Secondly the executive chairman owns a 24% stake in the company, probably since he assumed the position in 1989. I do wonder though what the hell an @-sign is doing in his name: he’s called “Tan Choo Pie @ Tan Chang Chai”. Is Spindex Industries cheap? Absolutely. Do I own it? No. Why not? Good question! Part of the reason is probably that I’m at the moment almost fully invested. If I would have 100% cash and zero other idea’s I would absolutely buy some shares. The second part of the reason is that it’s cheap, but it’s not the magical 50 cent dollar. It’s a bit of an arbitrary hurdle, and I have to admit that I have bought plenty of times stocks at a smaller discount, but when you are almost fully invested you can afford to be picky. This entry was posted in Research and tagged 564.SI on September 13, 2013 by Alpha Vulture. why would you want to add cash to the book value? It is already in there! Because I think the business is worth more than book value :). It’s a bit of a valuation short cut, but if the company has a 10% ROE with cash, and if we require a 10% return on the business the value of the operating entity is book value (which is higher than the ex-cash book value because it actually has a higher return on invested capital than 10%). I have come across quite a few ‘safe and cheap’ stocks in Singapore. I don’t really understand why they are so cheap, excep for the fact that they are illiquid and boring. I hope I am not the patsy. I simply look at the earnings power of the business combined with the excess cash on the balance sheet. On the basis of this analysis you’re buying Spindex at 60c on the dollar. Corporate governance seems ok, which is something I feel is quite alright in Singapore as a whole. I have looked at HK as well, but I almost always find a point which I don’t like. I now own a ‘basket’ of 3 of these stocks in SGP, with a fourth I am currently researching. 2 out of three names are not traditional net nets at a discount, tho trading close to the value. What they are, are decent owner operated businesses trading at very low multiples to their normalized earnings. As an added bonus, I think they should be able to compound their earnings at a decent clip. Given the combination of the decent quality of the businesses and the very cheap prices, the risk of capital loss is very low. I feel Spindex et al are simply trading at a high discount to what a rational private buyer would pay. I am just amazed these stocks are around given the frothy capital markets. I guess there is always some corner of the market that offers bargains. And I agree that it’s hard to see how you can go wrong in investing in stocks like this. Got a few more stocks in my research todolist that are located in the region and I think there must be something out there that I will really like. First up is something in Hong Kong, and then I have some more names in Singapore on the list, including Nam Lee Pressed Metals :). I have a quick question – what is going on with the two tables of results for “group” and “company”? Difference between consolidated (group) and unconsolidated numbers (company).